It's hard to see how a British innovation could be carried over into AmE (since Americans don't regularly watch our TV or films). Could changes like the stress shifts in comparable and exquisite be a sort of convergent evolution, where unexpected pronunciations are independently regularised on both sides of the Atlantic? I'm not sure about exquisite, but the older pronunciation of comparable (as 'kɒmpərəbəl or /'kɑːmpərəbəl/) is certainly unusual in having the stress four syllables from the end. Also, AFAICT the verb compare is always stressed on the second syllable, the “new” pronunciation of comparable might just be remodelled on it. "LPD3 doesn’t list it. I think that must be by an oversight, as it lists the plural with nɪʃ- for BrE." 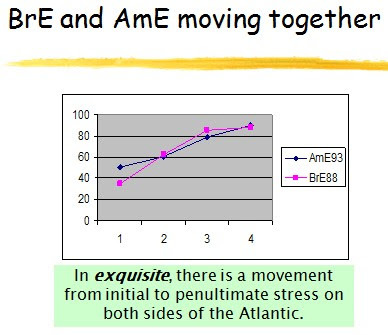 This can now be seen from your jpg of that entry, but you don't pick up on the nɪʃ pronunciation not being given for the singular but being given for the BrE plural, or on the fact that AmE speakers contributing to the 'niche' debate on Friday contradict your assertion that AmE has only nɪtʃ. This may still be true for all practical purposes, but it's a bit difficult to believe that there's a BrE plural in nɪʃ- which has no corresponding singular pronunciation. What would it be a plural of? 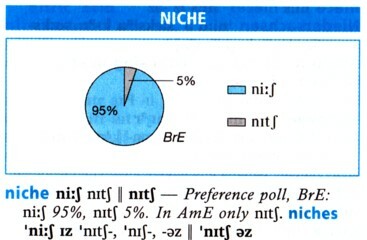 I see nɪʃ doesn't feature in the pie chart for your pronunciation poll, so it looks rather as if you thought it so marginal as to be beneath notice, and it was therefore the plural in nɪʃ- which was not intended to be there. Is that it? mallamb: Point taken. I had nɪʃ as third choice in the first edition (1990), and must have forgotten to remove it in the plural when removing it from the main entry in the light of the 1998 poll. ˈnɪʃɪz in the absence of nɪʃ doesn't seem all that improbable to me. ‘One niːʃ, two ˈnɪʃɪz’, just like ‘one briːtʃ, two ˈbrɪtʃɪz’? Perhaps I could be the first to make this thread veer off-topic by noting that Moët & Chandon are currently running ads on TV in the UK where the voice-over artist carefully pronounces the (abbreviated) name as məʊˈɛt - presumably they got fed up with the pseudo-French ˈməʊeɪ! You do make me laugh, but I think I have long since run out of the requisite brownie points for virages, so I will try to earn a few by only taking up your irregular plural hypothesis: mi no less facetious one would be that the singular is nɪtʃ on the analogy of 'texes' (tho usu verbal) and 'breakfases', vouchsafed by Martin Ball. See John's blog entry of 23 October 2009 on 'tex(t)ing'. Did nɪʃ actually score zero in the 1998 poll, for you to have removed it? John Cowan says NID3 and its descendant at m-w.com give /nɪʃ/, and so do other online dictionaries. Wiktionary and Wikimedia have a US sound file for it. I can't immediately lay my hands on the raw results of the poll, but the rounded figure was certainly 0%. That implies less than .05%, anyhow, and may be a true zero. Thanks, John. I'm a true zero myself, so /nɪʃ/ will do for me. Michael E: in the vast swirlinɡ world of conceivable but unused or little-used possibilities. 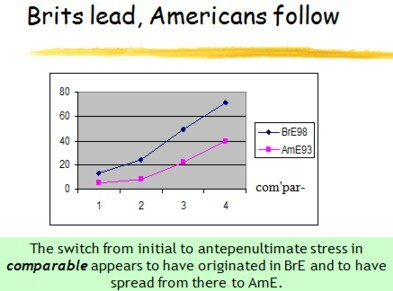 I agree with army1987: BrE-to-AmE is not impossible. Language change isn't effected by television alone, and anyway, they do watch British TV in the US, albeit less than the amount of American TV we watch. And there are Britons on American TV: Ricky Gervais, Russell Brand, Simon Cowell and Hugh Laurie are all familiar over there. Bill Bryson's famously error-strewn, but also fact-strewn, Mother Tongue has a list of words that spread from BrE to AmE: "smog, weekend, gadget, miniskirt, radar, brain drain, and gay in the sense of homosexual". /niːtʃəz/ is the plural of Nietzsche! I have to say, I find this quite interesting. 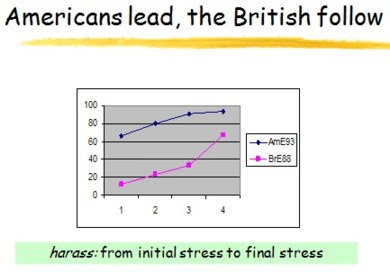 I'm an American, and I remember learning about niches in elementary school. At the time, if I remember correctly, it was pronounced /niːʃ/. It was only later in life that I remember hearing others say /nɪtʃ/. @Pete, these forms of 'comparable' are surprising. I was under the impression that the variants with initial stress often have an elided schwa (before the rhotic). So, something like /ˈkampɻəbl̴̩/ is produced. Although, perhaps these are more dictionary-style transcriptions. Dictionaries (or perhaps simply lexicographers) have long avoided the reality that English has syllabic sonorants. Hence, a schwa is inserted before /l/ in your transcription. I think, Christian, that if you were to study the treatment of "compression" and syllabic consonants in LPD you'd approve. Most sequences of ə plus a liquid or nasal alternate with a syllabic consonant, which can frequently then be reduced to a non-syllabic consonant. @Christian: I was using broad transcription (i.e. indicating only the phonemics and omitting the irrelevant phonetic details). Hence the slashes around /'kɑːmpərəbəl/ (which admittedly I left off /'kɒmpərəbəl/ by mistake). I was actually experimenting with JW's style of using boldface without any delimiters, which is how I ended up with slashes around one of my transcriptions but not the other. I'm sure I've always said /niːtʃ/. Perhaps I'll try to remember to frankify to /niːʃ/ now. Now I (as a speaker of Canadian English) wonder how Canadian English fits into all of this? Somewhere in the middle, but with a large French influence... I, myself, use /ni:ʃ/ (the French style), but then again, I do speak French, as well.